I never really had a purpose for Kirina’s Simple Black Dress until I came up with this type of outfit. Although some will argue that it is a great dress to wear around town, or, for other “general RP moments”…I can honestly say I’m really not into the dress; maybe because it seems a little bit too dark for Kirina’s style. However, the Simple Black Dress still makes a nice “date” dress alternative, especially if modesty for your character is an issue (compared to the Lovely Black Dress ^.^). 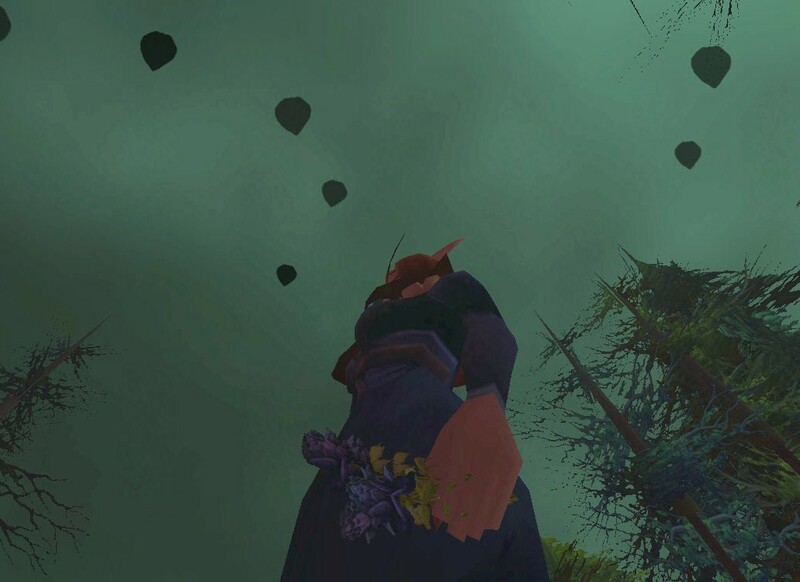 Yeah, I know, I have the Beacon of Hope equipped instead of the Bouquet of Ebon Roses. 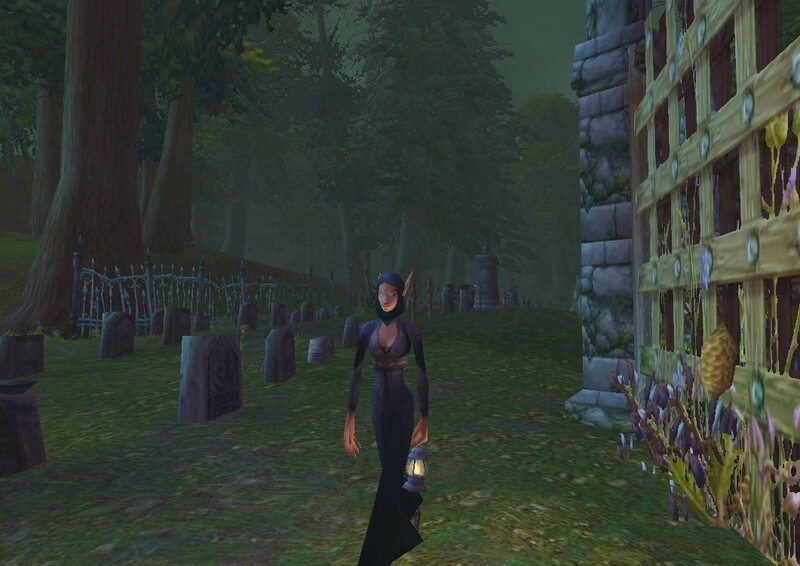 It, and lanterns just like it, are great to have around…especially for late night walks in cemeteries. The Cloaked Hood disappoints me. Although it is a nice black hood, I would much rather prefer my wish of hooded cloaks to come true ^_^ . It would seem much more fitting to have a black velvet, hooded cape draped over Kirina’s frame, rather than to have some sort of black fabric wrapped around her head…space…then the rest of the outfit. Here’s a “guy” alternative I put together the same night. While Kirina was “at location”, I saw that she had these pieces of gear on her and just put them together…attempting to create an “old-world” look of a mournful widower. The Buccaneer’s Boots may be a bit much, they were just the only blackish boots I had on me to equip on Kirina (although, I think they work well with the feel of the outfit ^_^ ). They, of course, may be substituted, as could the Comfortable Leather Hat. This hat is crafted by tailors; however, the pattern is a rare find. Although it is the same style as the Emblazoned Hat, its skin color is black, making the Comfortable Leather Hat more suited for a funeral, as well as a make-shift pilgrim’s hat (hopefully Blizzard will add an actual pilgrim’s hat with the new up-coming Thanksgiving world event). If you can’t get your hands on the Comfortable Leather Hat, there are a couple of helms that look the same: the Nocturnal Cap and the Fireheart Skullcap. However, these are also a low, random world drop (to a lesser degree, I guess ^_^).